Former World Champions Ko Sung Hyun and Shin Baek Cheol have entered their first international badminton tournament in over 2 years, in Vietnam, where Ko won his first international title 11 years ago. 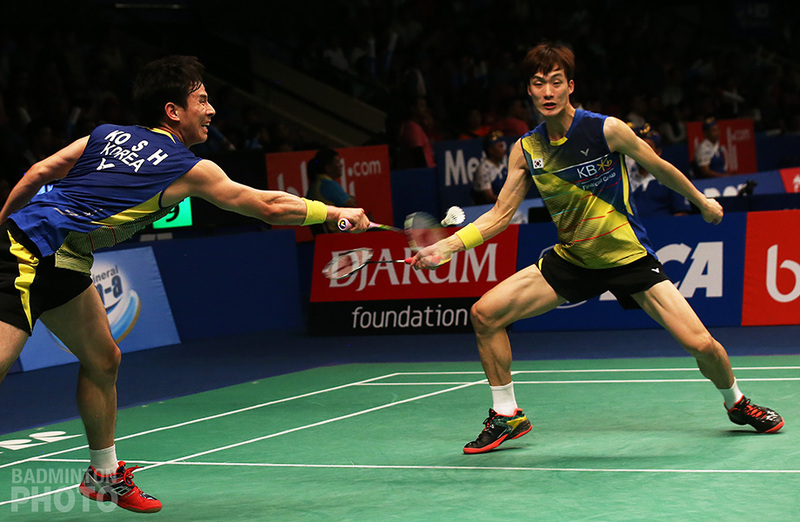 The Badminton World Federation (BWF) today published the entry lists for the Vietnam Open Super 100 and the men’s doubles qualifier list includes 2014 World Champions Ko Sung Hyun and Shin Baek Cheol (pictured). It will be Shin’s first international appearance since the 2016 Indonesia Open. He left the Korean national team before the Rio Olympics and officially registered his retirement with the BWF in October of that year. Ko continued to play mixed doubles with Kim Ha Na but left the national team in January of 2017. Ko chose not to retire from international play, however, but when the Badminton Korea Association (BKA) refused to send in his registration for Grand Prix Gold events, he pursued legal action, filing an injunction in late 2017. The Seoul High Court found in his favour a few days after he turned 31 years of age, at which time BKA rules had already said he would be allowed to compete independently anyway, but the judgment paved the way for the younger Shin to compete with Ko, in a partnership that has continued in domestic events. Ko Sung Hyun won the Vietnam Open Grand Prix event back in 2007, in only his second overseas tournament. A year earlier, it had been the first big title for Yoo Yeon Seong, who is also on the entry list for 2018, playing with fellow former world #1 Tan Boon Heong. Given that the Vietnam Open kicks off two days after the completion of the BWF World Championships in Nanjing, it is not surprising that few players will make it to both events but there are exceptions, particularly in the men’s singles, where top seed Ygor Coelho of Brazil will be joined by Liew Daren, Pablo Abian, Vladimir Malkov, Misha Zilberman, and 4-time champion Nguyen Tien Minh in making the trip down from Nanjing. In the other disciplines, it will be mostly just the Vietnamese shuttlers who have also qualified for the Worlds, such as former Canada Open champions Do Tuan Duc / Pham Nhu Thao (pictured right).